Ravioli are a Christmas tradition for my family. Every year, the four of us pack used to into the car and drive the eight hours from Vermont to Delaware (now, we migrate from our own homes) to spend the holidays with my huge Italian family. It's the most fun holiday of the year – with loads of delicious food, bottle after bottle of red wine, and a super loud group of fabulous Italians. Really, it couldn't get any better than this. Christmas with the Leo family means two things: gluten and dairy. Yes, that's right. The two things that I can no longer enjoy. The first year I spent this holiday with my food sensitivities was hard. So very hard. Our classic Christmas Eve meal was completely out – I couldn't enjoy the alfredo sauce, the antipasti, or the fried smelts. It was pretty much only crackers and wine for me! Then there is Christmas day to worry about. 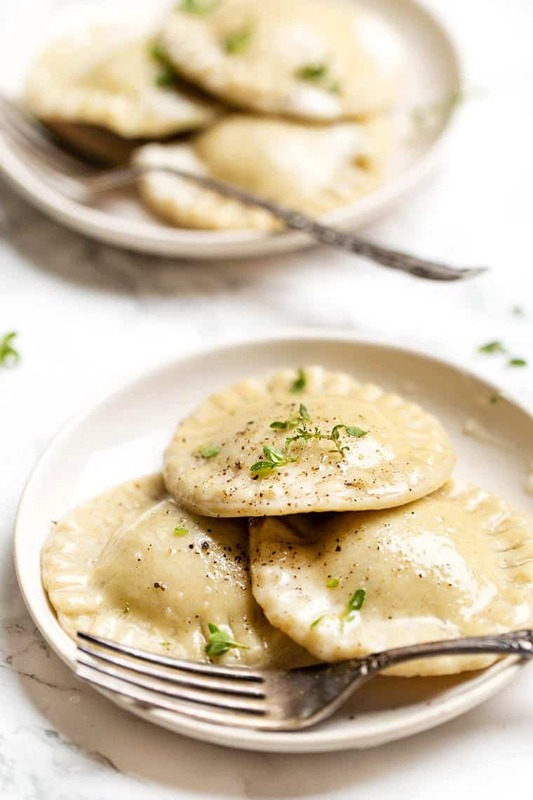 We have homemade ravioli – cheese and meat. Made with love by my grandmother, aunts, uncles and cousins, these ravioli are hands down the best on earth. They're packed with delectable fillings, smothered in my grandmother's famous gravy, with a side of her even more famous meatballs. A serious Italian feast, but unfortunately for me, all filled with gluten and dairy. What's a gf/df girl to do? After getting home that first year (now about 8 years ago), I decided… why not try my own hand at making my all time favorite meal of the holiday season? So that's just what I chose to do. Make my very own handmade ravioli, of course! I was on a mission. I'd never made pasta before, let alone ravioli, and knew it was going to be a labor of love. And boy was I right. Ravioli are tough to make! Much harder (and more frustrating) than I could have ever expected. It made me appreciate the hard work my family puts into our Christmas meal each year. My first attempt was about 8 years ago, so this year I decided it was high time to revisit the idea of homemade gluten-free ravioli and give them another shot. This go around? They were even better than the last. And I can't even tell you how excited to finally have some ravioli at Christmas this year! 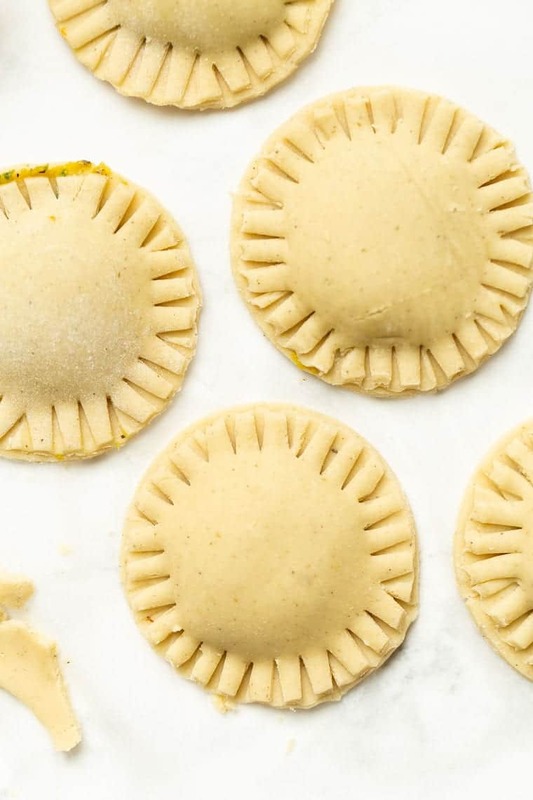 The most important part of any ravioli is the dough. Homemade gluten-free pasta dough can be a little tricky, so I turned to my the company I trust most when it comes to baking: Bob's Red Mill. 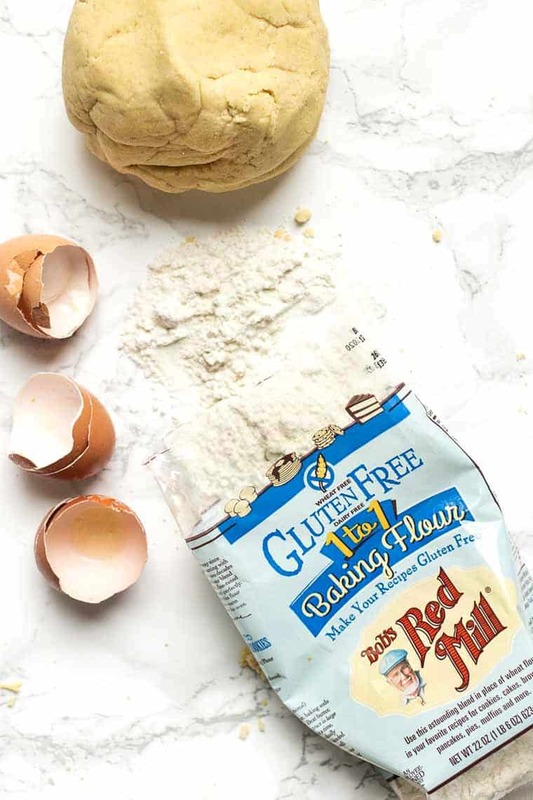 I have used Bob's Red Mill products ever since I went gluten-free 9 years ago – they've saved me countless times and taught me how to bake. For this recipe, I used the Bob's Red Mill 1-to-1 gluten-free flour. I absolutely adore their products for all of my baking needs, and even though I usually make my own blends, I wanted to keep this recipe as simple as possible. That meant going with their 1-to-1 baking flour which is the perfect blend of gluten-free flours, includes a little xanthan gum (which helps our pasta dough stick together) and has a light, fluffy texture. 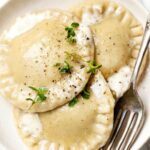 It literally makes the perfect gluten-free ravioli! Pasta is surprisingly simple to make. Just a few ingredients, blitzed up in a food processor and you have the dough. 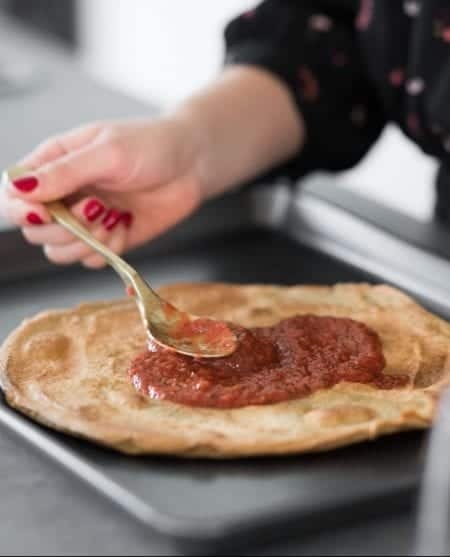 We're using just 5 ingredients in this dough and it ends up making a tender, soft dough that has a standard pasta taste –which makes it the perfect vessel for a fun and creative filling! I wanted to create something festive and delicious of these homemade ravioli so I went a classic: butternut squash. 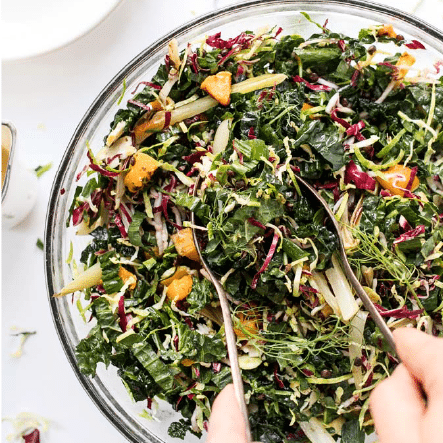 I love incorporating winter squashes into my recipes this time of year because they're packed with vitamins, they're in season (meaning inexpensive) and they're so tasty. Especially when you roast them which is what we're doing for this recipe. Let the dough rest. You want to allow your dough to rest for about 10 – 15 minutes before rolling it out – this allows everything to bind together properly. 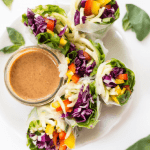 Use parchment or wax paper. Roll the dough between two sheets of parchment or wax paper. This will reduce the sticking as well as the amount of extra flour you use for dusting. Use medium pressure. The dough is a bit more fragile than a gluten-based dough, so just use medium pressure while you're rolling it out. Fill in the cracks. If the dough does crack (which is really shouldn't), you can fill in the cracks by pressing the dough together with our fingers. Firmly seal. The last thing you'll want to do is really make sure that your seals are firmly shut – to avoid exploding ravioli while cooking. I like to wet the edges with a little water and use a fork to press the seals together. In the end, you're looking for a dough that is about 1/8″ thick. And make sure that youEven though it takes a little extra for cooking, it helps you ensure the ravioli will hold up while boiling. 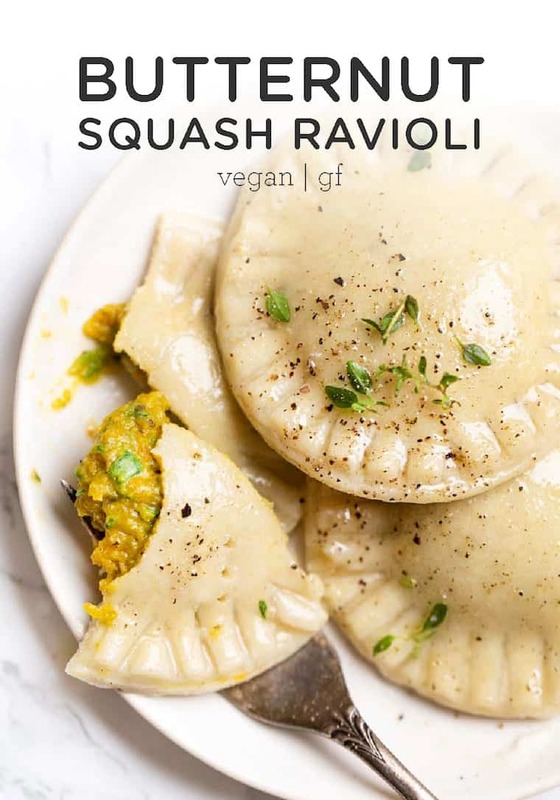 These amazing gluten-free ravioli are stuffed with a mixture of butternut squash and spinach that doesn't use any dairy! Preheat the oven to 400ºF. 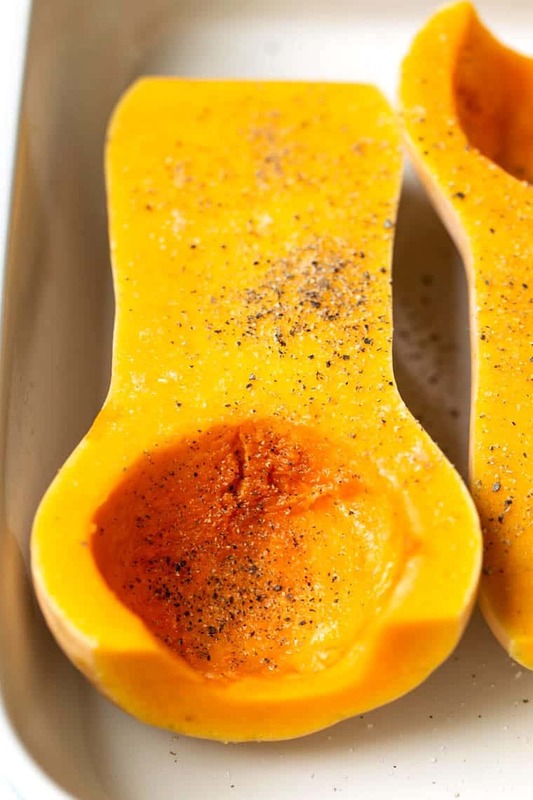 Cut the butternut squash in half (lengthwise) and remove the seeds. Place in a baking dish with the flesh side up and season with salt and pepper. Bake for 45 - 50 minutes. Measure out the flour and add it to a food processor. Add the salt, psyllium husk and eggs and pulse until a thick dough forms. Stream in the water and continue to pulse until the dough comes together. Make sure not to over blend it - dough can get tough very easily. 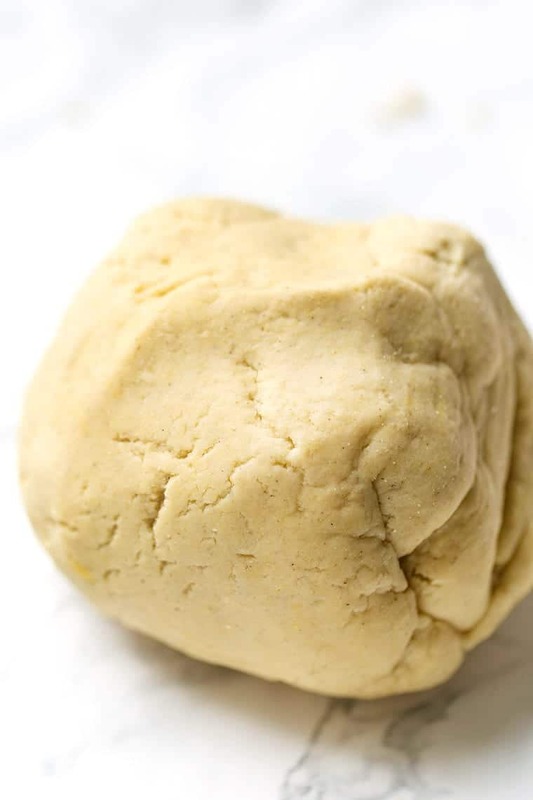 Transfer the dough to a gluten-free floured surface. Knead with your hands until you have a soft, well-combined pasta dough. Cover with plastic wrap and let sit for at least 20 minutes. Once the squash is cooked, scoop it out into the food processor. Add the nutritional yeast and spices and process until almost smooth (you want a little texture left). Pulse in the spinach. Set aside. Using a rolling pin, roll your dough out on a flat surface until it's very thin. Less then 1/8" in thickness if possible. With the large sheet of rolled out the dough, cut out your ravioli using a 2" biscuit cutter (circle) or knife (square). Take one circle and add a 1/2 teaspoon of filling, wet the edges with your finger and top with another circle of dough. With a fork, pinch the edges together. Repeat with the remaining dough and filling. Bring a saucepan of lightly salted water to boil. Carefully place the ravioli in the boiling water and cook for about 8 - 9 minutes (until the dough seems cooked through and they are floating at the top of your pan). Cook them in small batches at a time, about 5 - 6 to a pot. 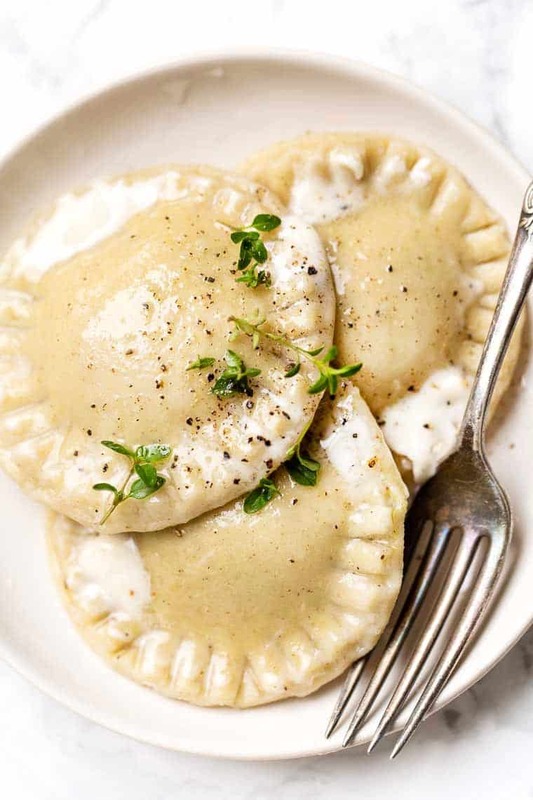 To serve: top the ravioli with your sauce of choice (it's great with pesto, red sauce or plain old dairy-free butter), fresh herbs and crushed red pepper. Cooking time can vary depending on the flour and thickness of the dough. Mine ended up taking about 11 minutes to cook through. I recommend cooking one ravioli before you drop them all in to test the cook time. As someone who is gluten-free and lactose-free (it’s been 2 years in my case) I can somehow relate. I mean, I face oppositions like no man’s business, but thankfully my friends never judged me. In any event, I remember making my own pasta from scratch as a child, but now that I’m gluten and lactose free, I actually attempted to make my own gluten-free and lactose-free pasta – without eggs. It worked when I did this by hand, but when I tried to use the pasta machine to make tagliatelle out of it, it flopped big time. But I’ll definetely try it out with eggs this time around. I am soooo happy this is using the 1 to 1 blend because that’s the blend I have but I didn’t think I was going to find any recipes with it because it’s primarily a baking blend, and I thought I was going to need to buy one special. I’m planning on using this to make dinner for Valentine’s Day for my boyfriend. These came out great. I was wondering if you could freeze them? If you can freeze them at what point would I do that? Before cooking or after? If you freeze before you cook is the cooking method after the same? Do you need to defrost them? Do you know how long they take to cook in the water? Cooking method is the same! 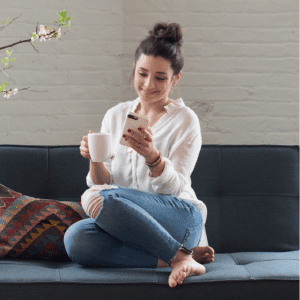 I haven’t tested them without eggs – sorry! What’s the 1/4 c water used for? These look great. I have seen flax used as an egg replacer in vegan pasta (gf too but it was chickpea) and the combo worked for the blogger. I haven’t tried it yet. I would reccomend King Arthur’s gluten free all purpose mix over Bob red mills. I have found that Bob’s has a metallic taste. When I use King Arthur’s mix my gluten eating husband will eat it too ( and says it tastes normal)! Thanks for the tip! I think next time I need to make my own blend. I’m just not a big fan of garbanzo bean flour…the taste just throws me off! Garbanzo bean flour is best with baking sweets. Making your own blend seems to work best. Melting butter down to a brown butter (has a nutty aroma) and add some sage leaves. Comes out great every time! Best of luck on your ravioli adventures! Thanks so much for all the information and recipe inspiration. It sounds like you’re a pasta lover like me that has needed to learn to navigate the world of gluten-free eating. The toasted hazelnuts sound delicious and no, I haven’t ever tested with goat cheese although I’m sure it’s totally delicious. One question I have for you. Do you ever find that using Bob’s Red Mill AP has too much a bean-like flavor? That’s what I used in this recipe and I am not the biggest fan of bean based flours. I’m thinking of trying a sweet sorghum, quinoa, or brown rice flour (mixed with starch) in my next recipe. Would love to know if you have tried other flour combos! Hi Dawn! Good luck indeed. I've been interested in trying raviolis egg free as well, but haven't summed up the courage yet. Please let me know how they turn out! PS. not sure which kind of flour you're thinking of using, but I would stay away from bean flour. It really was too heavy and gummy. I would go with something lighter – maybe brown rice? They look amazing. I would love to try these egg and nut free so my daughter could try them as well! Will be interesting to see how they hold together with egg replacer. Wish me luck!